Eviction Counseling To Real Estate Managers, Landlords and Commercial Tenants - Boston Real Estate Attorney. Eviction Law. Zoning and Variances. Housing Discrimination. Massachusetts Landlord-Tenant Practice: Law and Forms, previously published by Lexis-Nexis. The book is a 600-page practice manual directed toward both lawyers and property managers widely used throughout Massachusetts by landlords’ lawyers, tenants’ lawyers, and judges. 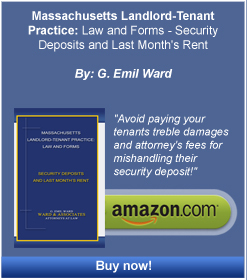 Massachusetts Landlord-Tenant Practice: Law and Forms: Security Deposits and Last Month’s Rent. The book teaches you how to avoid the pitfalls of the security deposit statute and is available on Amazon. The firm also counsels its clients regarding their rights and liabilities under the new medical marijuana laws and premises liability. We have successfully defended several recent class action cases alleging security deposit violations. * All of these factors act in concert to put the Massachusetts residential landlord at a distinct disadvantage compared to the Massachusetts residential tenant. Thus, it is that you should have a firm which is experienced in landlord and tenant law on your side. Although the law in the commercial context is shifting slowly toward the commercial tenant, commercial landlords still have the legal advantage in the commercial arena. Commercial tenants must be wary of the leases they sign and should have a thorough legal review of the lease before signing. After all, such leases dictate rights and liabilities for 5 to 10 years or more. It is equally important for the commercial tenant or landlord to have experienced counsel in this area because in many ways it is just as intricate as the residential area. Over the years, our firm has handled commercial lease negotiations, commercial landlord- tenant litigation, and defense of commercial tenants. Our firm has represented a large number of landlords for almost four decades. These clients run the gamut from those who own a single-family rental property to large owner-managers who control thousands of units of rental property. We represent both commercial landlords and commercial tenants. For a number of years we represented the Massachusetts Housing Finance Agency, now known as MassHousing, as lender’s bankruptcy counsel and as their eviction counsel across Massachusetts. We also have experience in workouts which are designed to avoid foreclosure. Some of Our Clients Have Been With the Firm for Several Decades. Our firm has conducted thousands of evictions in almost four decades of practice and we have a very high rate of success. We have spent much of that time in the Housing Courts as well as the district, superior courts and Land Court. As attorneys for large and small landlords, we have been called upon to advise our clients regarding day-to-day management issues such as standardizing application screening and review, eviction assessments and the handling of security deposits, standardizing effective complaint and repair systems, setting up reliable record keeping and evidence assembly procedures (in the event a case must be brought or defended in court), and drug eviction procedures, to name a few. One of the most effective landlord defenses against tenants’ claims is good record keeping. We have found that many landlords do not know how to properly keep reliable records. For questions on Evictions Counseling to Commercial, Residential Landlords and Commercial tenants, contact us below. Let us put our in-depth experience to work for you solving your legal problems without delay.